Be it a bag, a sofa or a stunning pair of leather shoes, when you purchased the leather item, you have made an investment that can last a lifetime. It could be the charming sofa that you have always wanted to complete your home with or a statement piece to match your fashionable outfit, leather is clearly a luxurious material that will still look amazing even as it ages. Leather exudes a sense of character, a showcase of what the item has been through as time went by. To ensure that the brilliant legacy that you have planned in mind to leave for this world would happen, you will first need to take good care of your new piece, especially when you are living in Singapore, where the humidity level can get rather high at times. Though leather has been often doubted as a low maintenance material, you will find that it is actually effortless to care for when you have got the know-how. Depending on the look that you are envisioning for the leather piece to achieve in years down the road, you would then be able to determine how you would care for them. It is pretty much like a masterful art piece in the making that needed the element of time to complete—like the formation of a canyon— though way lesser time is required in this case. Have a vision, a master plan. It could be either a polished, clean look or a worn, rugged appearance or somewhere in between. The latter two would require lesser attention. Now that you have a vision, it is time to take action. Starting with the utmost basic of keeping anything in good condition is by wiping off any surface dust and loose particles with a clean, dry and soft cloth, followed by a damp cloth to pick up any remaining dust. Though leather is a material that is tough as nail, it is not spared from the clutches of dust and dirt. Hence a regular cleaning regime can do wonders for its outlook. For areas that are difficult to reach, like the dimpling tucks of the Chesterfield Sofa, try using a soft bristle toothbrush or a vacuum cleaner fitted with a soft brush adapter. Just like your skin, leather has no exception to the ageing process of drying, cracking, wrinkling and more. There are many options for treating and caring for your leather pieces so that they would stop any sign of ageing and/or age gracefully. And just like leather needs to breathe. It requires proper ventilation to prevent mildew and mould, so keep your leather jackets, bags, shoes and watches in places that are well ventilated instead of being cooped in a plastic bag. Pillowcases are great options if you have lost the dust bag that usually comes with your leather item. If you are staying away from the sun to keep your skin from premature ageing, your leather item would need that care too. When exposed to the harmful ultraviolet rays and heat of the sun, the colour of the leather would naturally fade over time and is prone to drying and cracking. If this happens, you would need to care for it just like how you would for your skin. An essential part of any skin care routine is moisturising. It is to keep your skin supple and soft. This is similar for leather too. Although leather contains natural oils, they often dry out after a period of regular use or being exposed to natural elements. 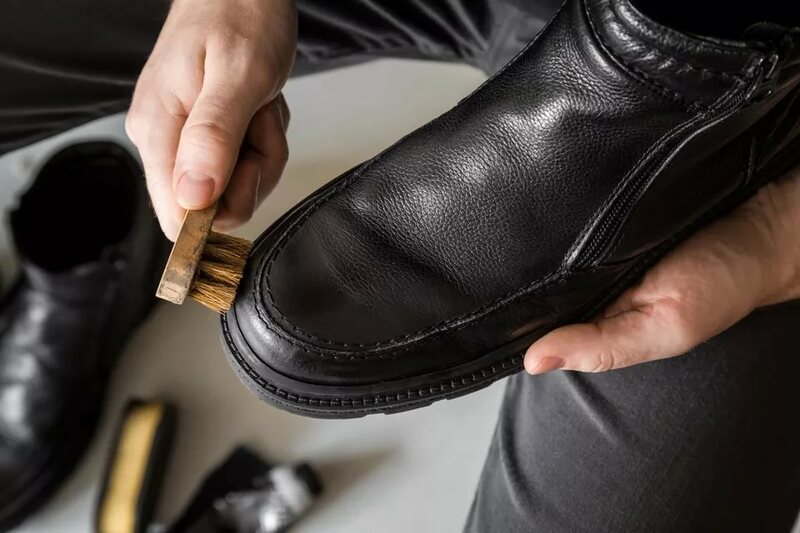 So get yourself a good leather moisturiser or conditioner and rejuvenate the oils of your leather item to prevent them from creasing and drying out. If your leather product has a natural shine instead of a matte finish, you would need to give it a buff to preserve that shine. Like a gentle exfoliation for your skin to achieve glowing skin, use a micro-fibre cloth and gently buff your sofa or leather bags. This would give your leather piece a quick and effortless uplift. Yes, you have read it right. Leather is prone to staining and discolouration too. A general rule to keep them steered clear of stains caused by spills is to react immediately. Either with your bare hands or a dry cloth, rid the liquid from the surface of the leather immediately. Then with a dry cloth or napkin, carefully blot the area. Do not wipe as it may cause the liquid to be absorbed by the leather. For pen marks, go in gently with a cotton swab dipped in rubbing alcohol or nail polish remover. Have a piece of damp micro-fibre cloth by your side to wipe off the alcohol immediately after each swipe of the cotton bud. If the pen mark does not budge in your third attempt, clean the area with the damp cloth and see professional help.